French Emblems: Emblem: Mathiae Corvini Symbolum, Symbolo Ioan. Regis auctum. The Device of Mathias Corvinus, augmented with the device of King John. Dum superat cunctos, ingeniosa fovet. Et fuit invicto principe dignus honos. Quo foret authorum fama, decensque labor. Link to an image of this page [L1v p162]Et pavidos multo sanguine fudit humi. Pannoniae infestae quis non metuebat habenas? Tum Venetum supplex factus & ipse leo est. Et proceres concors sensus in arma vocet. Iura, salus nulla est pòst reditura die. Arma, nec impensis bibliotheca minor. Nec minor inceptis gloria semper erit. Just as the wolf feeds not only its own offspring, but also others’ as well (whence, Rome, your leaders came), so Mathias, King and greatest lord of the Huns, while subduing all, fostered the liberal arts. The whole world ran to pay respect to his sway, and he won honour fitting to an unconquered prince. He brought together from all lands the monuments of the ancients, to give lasting honour to the authors and honest work. He broke down the proud Thracians with only the power of his name, and put them, fearful, to flight with much blood on the ground. Who was not afraid of the reins of a hostile Pannonia? Even the Venetian lion was forced to beg for mercy. Nor was the crow-Apollo, singing sweetly from a strangled throat, held inferior to the griffon. O, if only those who had succeeded him in rule had conceived in their minds of the triumphs and great acts of the prince: but cruel discord resigned the civil power, and agreement of intent called the great and good to arms. Which, if it had not happened when you, Maximilian, held power, no safety would ever have returned. Remembering him, you prepare arms against the Getic foe, and the library you have bought is no smaller than his. The praises of which will be repeated by a grateful old age, nor will the glory of your endeavours ever decline. 1. Matthias Corvinus was King of Hungary 1458-1490. See emblem 51. His symbol was a raven (corvus). 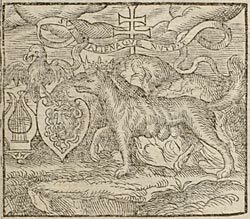 King John refers to János Szapolyai (Zápolya), who was king of Turkish-occupied Hungary from 1526 to 1540, causing a split between those Hungarian nobles who supported him, and those who supported the Habsburg claimant, as referred to in the text below (his arms bore a wolf). 2. Here Thracians means Turks (as does Getic foe in line 21). Neither the Turks, nor the Hungarians (Magyars) had arrived in the Balkans in the Classical period, so Sambucus employs Classical names of the (unrelated) Huns and the Roman province, Pannonia.